Kevin Hayes' Impact on the Winnipeg Jets - The Point Data-driven hockey storytelling that gets right to the point. 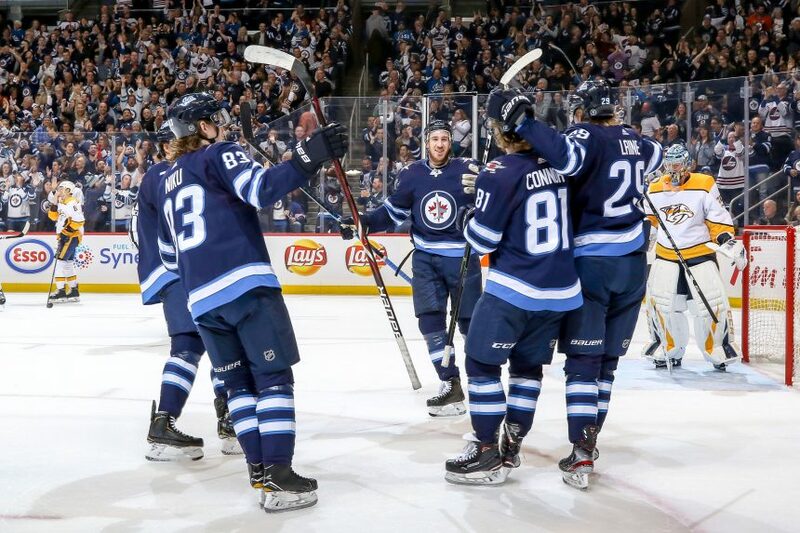 The Winnipeg Jets have gone into a downward spiral defensively to close out the 2018-19 season, and no longer hold the hammer in regards to winning the central division crown, and could even end up losing home ice if the St. Louis Blues win their last game and the Jets find a way to lose to Arizona. However, the news isn’t all bad. Newcomer Kevin Hayes has been producing relatively well with five goals and 12 points in 19 games, which is down from his pace with the Rangers, but it’s important to note that none of those points have come on the powerplay, so his even strength production is actually just as strong as it was with the Rangers, even slightly ahead. Unfortunately, so far the addition of Hayes hasn’t had the desired impact on Bryan Little, as the shift down in responsibility has left him ice cold with just a single goal and an assist in 19 games since the trade deadline, but the Jets just have to hope that he can find is game before the playoffs begin. Hayes was brought in to create offense, so aside from the point production, how is he playing? Is he fitting into the lineup and producing as expected, or just having short-term success? Let’s break down what he’s doing at 5-vs-5 compared to the average Jets forward. Not normally a high volume shooter, Hayes is keeping pace with the Jets’ average in high danger scoring chances and scoring chances on net, and significantly ahead in overall shot attempts from the slot area. In fact, only Kyle Connor is taking more shot attempts from the slot at 5-vs-5 than Hayes since the deadline, so the goal scoring he’s produced seems to be completely earned. 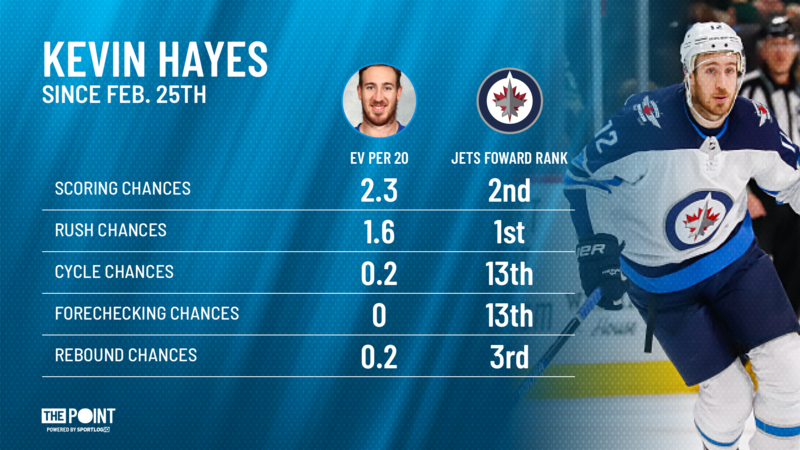 Playmaking is where Hayes really shines though, and his 1.61 completed slot passes every 20 minutes leads the Jets by a wide margin since his acquisition in February, and he’s among their better players at making plays off the rush as well. Putting these factors together, it shouldn’t come as a surprise that Hayes is leading all Jets players in scoring chances created for teammates since he was acquired, narrowly edging out Mark Scheifele at a hair above seven per 20 minutes of ice time. 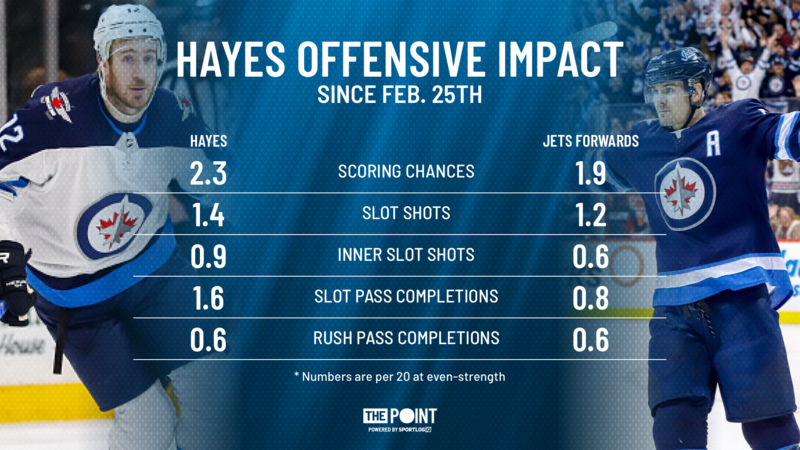 On top of producing a lot of offense for the Jets, arguably the most important aspect of Hayes on the roster is the way he produces it. Let’s look at his scoring chance types to illustrate it. When I wrote about the possibility of the Jets adding Hayes at the deadline in mid-February, the thing I was most focused on was his ability to add attacks off the rush, an area where the Jets were sorely lacking, despite being a premier cycle and forechecking team. In my wildest estimates, I didn’t expect him to feast this heavily on rush chances, but apparently, he doubled down on what he’s good at. While with the Rangers, Hayes was producing 0.7 scoring chances off the rush per 20 minutes of ice time at even strength, which is a highly respectable number and would have been the second-best mark among the Jets forward group aside from Ehlers. Since the trade, he’s more than doubled that, constantly creating controlled entries into the offensive zone and sneaking into the slot for shots. Once the zone is gained and a cycle is established, Hayes is far less likely to shoot and prefers to lean on his playmaking ability to get his teammates scoring chances, and I have to think that this is eventually going to click with Patrik Laine and result in some goals, the two players are simply too good at this to not find something together. Hayes hasn’t produced much off the forecheck, but his line doesn’t really have the strong forechecking element to it that the rest of the Jets’ lineup does, so that’s to be expected. What is a little surprising is that Hayes has been aggressive in crashing the net to get rebounds, something not many playmakers are willing to do, though Hayes’ hulking 6’5” frame gives him some leverage in that area of the game that he’s smart to put to good use. Hayes also adds another factor that contributes to offensive gains more indirectly, one that is related to his absurd numbers off the rush. Earlier in the season, I had mentioned several times that outside of Nikolaj Ehlers and Scheifele, the Jets’ forwards had been struggling to transition the puck up the ice this year. Since Hayes’ arrival, he’s completing the third-most transition plays on the team, which allows for more chances off the rush for both him and his linemates. It’s not a revelation to say that the Jets’ offense should be great heading into the playoffs, but the added element of having multiple lines that can attack off the rush makes the Jets far more difficult to defend, and addresses some of the transition speed issues they struggled with against Vegas last season in the Western Conference final. If the defensive coverage can wake up, the Jets can be a scary team.